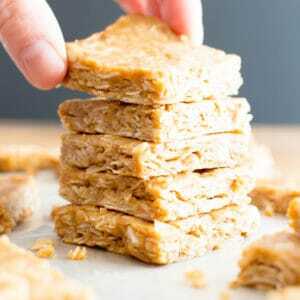 4 Ingredient No Bake Peanut Butter Coconut Oatmeal Bars (V, GF): an easy, one bowl recipe for protein-rich, gluten-free oatmeal bars bursting with peanut butter and coconut. Vegan, Gluten Free, Dairy-Free, Refined Sugar-Free. Line an 8-inch square baking pan with parchment paper or wax paper. Set aside. Clear some space in the freezer for this pan-you will need it later. In a medium, microwave-safe bowl, add peanut butter and maple syrup. Whisk together until well mixed. Add coconut and oats. Stir and fold until thoroughly combined. Pour this mixture into the prepared baking pan. Using a rubber spatula, smooth into an even, tightly packed layer. Freeze for 25-35 minutes, or until firm and completely chilled. Slice into 16 bars. Enjoy! Storing instructions below.Looking for more Peanut Butter treats? Try these chocolate peanut butter no bake bites and these vegan peanut butter cookies. - Adapted from my 4 Ingredient No Bake Peanut Butter Coconut Oatmeal Cookies. - Store in an airtight container in the refrigerator for 1-2 months. After the first day, you can store them at room temperature-they'll be more firm. - More no bake peanut butter recipes: no bake chocolate peanut butter oatmeal cookies, no bake peanut butter chocolate bars, 3 ingredient peanut butter no bake energy bites.